No, Darren Elias didn't join the Four Horsemen, he did however win his fourth World Poker Tour title Wednesday night in Las Vegas. When the final table of the inaugural World Poker Tour Bobby Baldwin Classic started Wednesday afternoon in Las Vegas there was no shortage of star power or storylines. 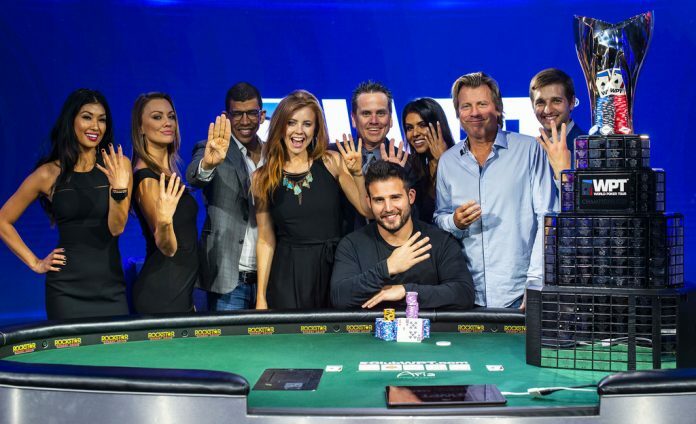 Darren Elias was going for his record fourth WPT title. Jonathan Little and Sam Panzica were attempting to become the sixth player with three titles. Dietrich Fast was hoping to etch his name onto the Champions Cup for the second time. Joe McKeehen was hoping to put an exclamation point on a WPT Player of the Year season. Kitty Kuo was hoping to become just the second woman to ever win an open WPT event. Elias rose above all of those to etch his name in the WPT history books yet again. Little’s run at his first WPT title since 2008 ended just 13 hands after the final table began. Action folded to Little in the small blind and he completed the bet. Sam Panzica moved all in from the big blind and Little called. Panzica tabled which put him behind Little’s . The flop put Panzica ahead and all Little could do was watch as the turn and river failed to help him out, eliminating him in sixth place. Despite picking up Little’s stack, Panzica didn’t stick around much longer. One hour later Panzica clashed with Elias and was unable to survive. Panzica raised to 35,000 from UTG and Elias made it 110,000 to go from UTG+1. Panzica moved all in for 385,000 and Elias called. Panzica turned over and was racing against Elias’ . The board ran out to send Panzica packing in fifth. It was another later when Kuo raised to 125,000 from the big blind after Fast limped his button and Elias defended his small blind. Fast called Kuo’s bet and Elias got out of the way sending the two players to a flop. Kuo moved all in for 980,0000 and Fast called all in. Kuo showed while Fast had . The drama ended on the turn as Kuo completed her flush and Fast was eliminated in fourth place as the river completed the board. Ten hands later McKeehen, who needed a win in this event to pass Art Papazyan for WPT Player of the Year, found himself on the ugly side of variance and headed out the door. Elias raised to 45,000 from the button before McKeehen re-raised to 180,000 from the big blind. Elias responded by moving all in for 2,078,000 and McKeehen quickly called all in and turned over . Elias turned over but got great news on the flop. The turn left McKeehen with just two outs and the river wasn’t one of them, eliminating the 2015 WSOP Main Event champion in third. Elias started heads up play with a nearly 3-1 chip lead over Kuo but it took him 103 hands and just over three hours to put a cap on his fourth title. Down to just 7.5 big blinds, Kuo moved all in from the button with and Elias called with . The board ran out to eliminate Kuo and give Elias $387,580 and his fourth WPT title. Elias’ previous WPT titles came at the Borgata Poker Open (2014), WPT Caribbean (2014), and the Fallsview Poker Classic (2017).